You made a match! Guests will soon be on their way to spend extended time at your home. Cleaning your home before they arrive is an essential ingredient in the recipe for a successful stay. To help you prepare your home, we’ve compiled a helpful cleaning checklist. The Sabbatical Homes scholarly community standard of clean: A+. Living Room: Let your guests live fully in your space by making it fresh and inviting! Declutter (pack and store personal items away). Vacuum Couches, and while you’re at it–fish out any hidden treasures from under your sofa cushions! Straighten and fluff throw pillows. Dust large pieces of furniture. Wipe down windows and mirrors. Bedrooms: Give your guests the gift of sweet dreams in a clean, cozy space. Change the sheets and make the beds. Clean up cobwebs and wipe down windows. 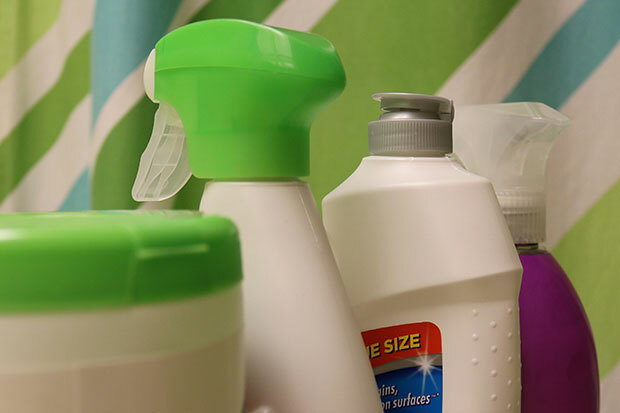 Bathrooms: It’s hard to feel squeaky clean in a bathroom that’s anything but, so be sure to spend some time scrubbing it down! Declutter (pack and store personal items away and leave ample countertop space for your guest). Scrub the sink, counter and faucet and give it a quick rinse. Clean the tub, shower, and toilet. Ensure you’ve stocked staples: toilet paper, hand soap, clean towels and washcloths. Kitchen: Sugar, spice, and everything nice. The most-loved room in any home certainly deserves some freshening up. Declutter (remove stray countertop items to leave ample space for your guest). Clean the sink and countertop. Scrub stovetop and oven door. Toss expired food from your fridge to make room for your guests’ groceries. Run the dishwasher and put away clean dishes. Pack away and store any delicate, or sentimental, dishware. Ensure you’ve stocked staples: paper towels, hand soap, clean dish towels and napkins. Outside. If the weather permits, cleanliness should too! Wash or wipe down cushions. Hose down the deck or patio. Toss out and replace melted citronella candles. Ensuring your home is clean for your guests’ comfort is a gesture that will not go unnoticed. Your thoughtfulness, and cleanliness, will be greatly appreciated! Cleaning the home for guests always requires more work than normal cleaning days! In that time I see dirty things that I haven’t realized they were dirty before. The thing is that I start to think like my guests and I pay attention to every part of the home. The post is very helpful and gives me some great cleaning tips. Thanks! Doing home exchanges and rentals for the last 9 years has made me look at my home through my guests’ eyes. The extra attention I pay to it makes it nicer for me to enjoy, too. I keep a couple sets of my newest towels packed up to use only for guests; they stay new longer and I don’t have to hunt around to match up a set. If my sheets are looking a little worn, or my shower caddy is getting rusty, I’ll buy new ones – it’s a small investment that I benefit from, too. And when I go through my closets to make room for my guests’ clothes, I’ll take that opportunity to take a load of old clothes to the thrift store. Great post. Cleaning the house is always a plus, but when a guest is over, that’s when we need to get to it! The cleaning checklist covers the cleaning tasks I would tackle as well. What I like most about house cleaning for guests, is leaving a clean smell throughout the house for when they step foot in the door. No pet odor when they come around! I like the valuable info you provide on your blog. I do believe all of the ideas you’ve presented in your post. Keep sharing. As a guest, and a property owner, I always look at cleanliness over all and whether light switches, moldings, baseboards and walls are clean. Make sure there is good lighting available. Pride of ownership and attention to details make tenants feel better about your home and they are likely to reciprocate by taking better care of your home, and may feel more generous about tending to smaller issues or deficiencies as they arise, and leave your home in better condition when they depart. A binder of how-tos, emergency numbers, medical providers and local resources is a nice touch as well.